After a very late night after arriving in Majorca, I awoke from a very disjointed sleep at around 9am. I always find the first night somewhere new restless! Slapping some sun cream on, we headed out in search of breakfast as there was nothing in the apartment and walked down to and then along the waterfront. 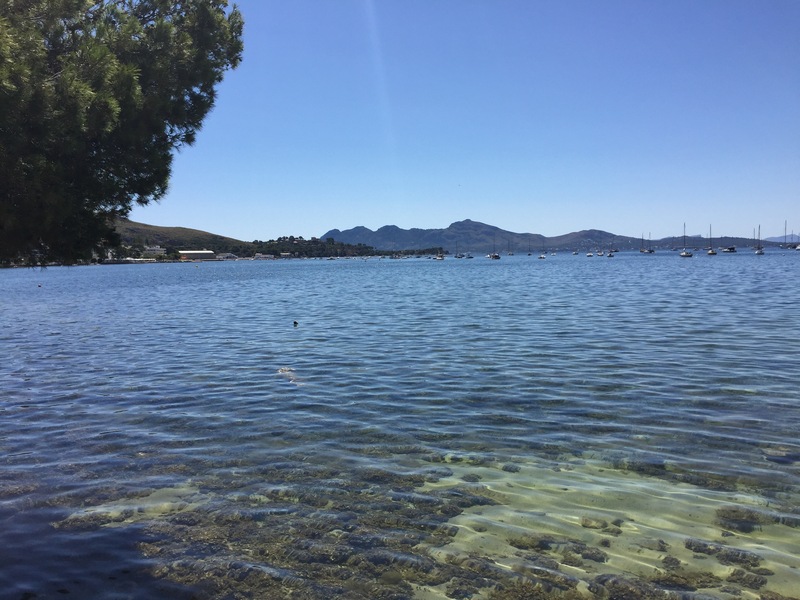 Puerto Pollenca is a beautiful seaside town set in a gorgeous bay surrounded on either side by towering hills. It seems to be a relatively quiet and peaceful holiday resort and while it is very touristy, it is mostly young families or older couples and therefore it is very pleasant. 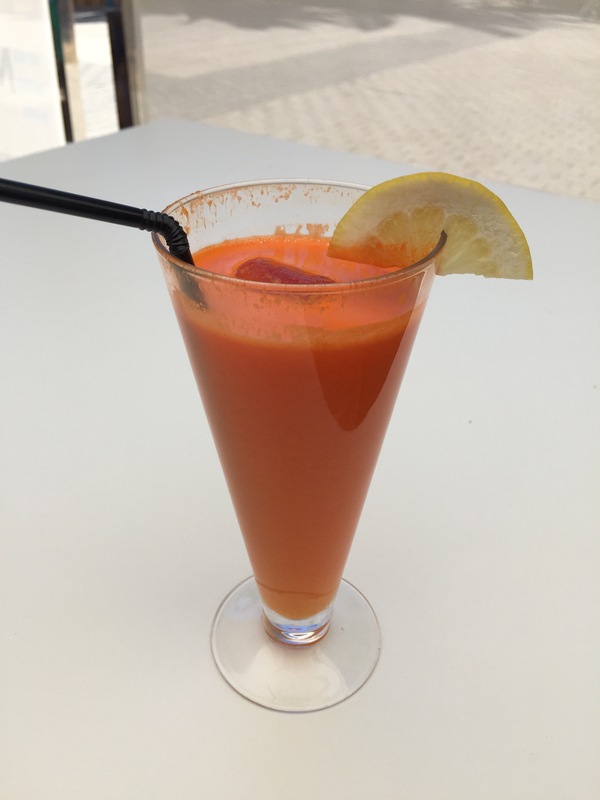 Our first stop was obviously food (my world revolves around my stomach) and I filled up on scrambled egg on toast and a carrot and orange smoothie to start my first day in the sun. At first glance there seems to be a great range of restaurants and bars here, catering for every need from fine dining, cocktails by the water and classic English pub grub (if that’s your thing). I can’t wait to try some of them out this week! Once we were well fed and watered, we carried on along the seafront right around the edge of the bay. Once off of the main strip the pathway gets greener, the houses and hotels grander and the beaches quieter. You would hardly believe you were in a tourist destination and it was lovely to stroll along, taking in the views and the fish bathing in the shallow waters inches below your feet. It’s very easy to see why this is a favourite among retired Brits. After walking for around an hour and half and covering around 5km, we stopped in a supermarket on the way home to stock up on fruit, bread, water and other snacks for the apartment before staggering home in the midday heat. I needed a break from the sun by this point (being blonde and pale is sometimes such a curse!) and therefore the coolness of our accommodation was greatly welcomed. At around half 2 we then headed for the beach, where we paid 15 euros for two sun loungers and an umbrella. We spent the next 5 hours laying in the heat, paddling in the sea and chilling out – exactly what I need after such a hectic time at work recently! Packing up at 7.30pm (it was still 26 degrees!) and heading back to the apartment, we snacked on bread and alioli (an amazing garlic spread which you HAVE to try) and then napped for a couple of hours, waking at around 9pm to shower and get ready for dinner. We visited a local restaurant and had a casual dinner of swordfish, bread and olives before deciding to call it a day; wanting to catch up on sleep from the previous night desperately. My first day in Majorca is over and it was lovely to relax and have a bit of an explore of the area. I can’t wait to get out in the hire car tomorrow and visit the surrounding areas! Stay posted for market visits, hill climbing, bay swimming and cocktail drinking! If anyone has been to Majorca and has any advice on places to go please do let me know!